The way that the game is played (the way that I know of): There are 200 cards. 100 of the cards written with poems and some nice drawings will be spread on the floor face up. The reader will read the other 100 cards which contain only the last two lines of the wake poems (out of 6 lines). You try to pick up a card as fast as you can when the reader reads a card (again, what a reader reads is a later 2 lines) When you become very good at it, you will know each poem after hearing the first syllable or two. 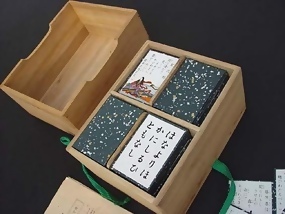 This is a good set to have for someone studying Japanese Waka (poems) and the culture. It is a great way to start a family tradition. New condition, it does not appear to be used at all.